Earn $12.00 in Podium Club credit (1200 points)What's This? 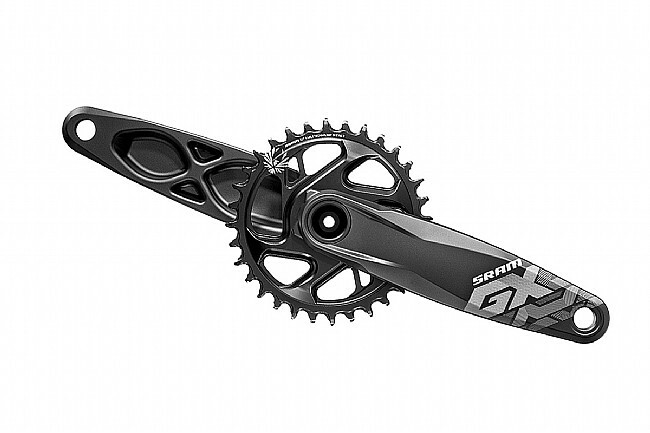 The SRAM GX Eagle Crankset GXP is designed for all-out performance on 1x mountain bikes. Bringing an updated tooth design, the X-Sync 2 technology is engineered for complete chain control. Every pedal stroke is met with instantaneous power transfer, thanks to the aggressive teeth design and the 7000-series aluminum construction. Accepting direct-mount chainrings, this GX Eagle Crankset comes with a 32T X-Sync 2 chainring pre-installed, providing a 500% gear range when paired with the GX Eagle cassette. Available in a variety of bottom bracket configurations to provide compatibility with a wide range of bicycles, this crankset features a 24/22mm spindle diameter for compatibility with GXP bottom brackets. Of course, the GX Eagle Crankset is compatible with all Eagle drivetrain systems, and following in the pursuit of versatile compatibility, features versions with a 49mm chainline for traditional spacing, or 52mm chainline for Boost-spaced bikes. 7000 series aluminum crank arm construction. Updated X-Sync 2 Tooth Profile Technology provides better chain retention and smooth, efficient pedaling. 49mm Chainline for bike with traditional (non-Boost) spacing. 52mm Chainline for bikes with Boost spacing. 24/22mm spindle diameter for compatibility with GXP bottom brackets.